This site is brought to you by MONINI S.p.A., which has its registered office in S.S. Flaminia km 129, 06049 Spoleto (hereinafter referred to as Monini). The information available on this website about Monini S.p.A., its affiliate companies and third parties has been collected with the utmost care; however, we are unable to guarantee its completeness or correctness. 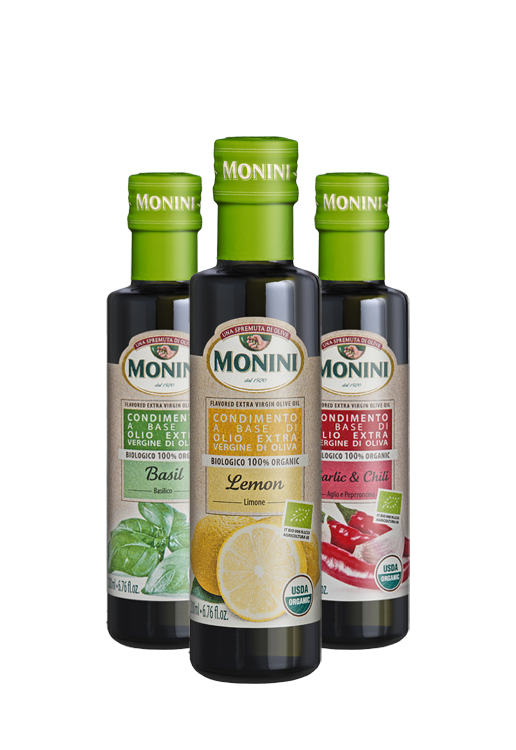 Monini declines any liability for mistakes in the contents of this website. The information contained in our website is not intended or approved for use within the United States of America, by U.S. citizens or by individuals residing in the U.S.A. These users should refer to their local Monini website or the website of Monini’s local affiliated companies. The pages of this website are protected by copyright. Specifically, pursuant to Law 633/1941 (the Law on Copyright), the content of the site is protected against duplication, translation, and insertion or conversion into other media, including insertion or conversion using electronic means. The reproduction or economic exploitation or all or part of the content of this site is permitted only with the written consent of Monini. Both this site’s content and structure are protected by copyright. Specifically, the duplication of information or data and the use of texts (or part thereof) or images contained on the site (except for photographs of Monini for press use) requires Monini’s prior written consent. Illustrations, pursuant to Article 1 of Law 633/1941, are also protected by copyright. The right to publish and reproduce these designs is held entirely by Monini. The copyright on the designs also remains in force for designs automatically or manually added to an archive. Copyright © (2018) Monini S.p.A. All rights reserved. Although such reproduction is free of charge we require a copy for our files. The names of the products published on this website are trademarks owned by Monini S.p.A. and are protected by the Law on Trademarks (Legislative Decree 30/2005, as subsequently amended and supplemented) and by the regulations on unfair competition. a)This website may contain links to other sites that are not owned or managed by Monini. Monini cannot monitor the content of such websites and therefore it cannot be considered liable for any consequence arising from their use. The fact that Monini provides links to these sites does not imply any endorsement of their content; they are provided solely to make your navigation easier. In particular, Monini does not assume any liability for any breaches of statutory provisions or infringements of third party rights arising from the content of these sites. b) For websites to which hyperlinks are provided from the Monini website, the owners of these websites are solely responsible for the content of these pages as well as the online sale of products and their conditions of sale, handling of orders and/or consequences arising from the purchase of such products. c) Monini does not assume any liability for any infringement of any copyrights, trademarks or privacy rights arising from accessing a site linked to Monini’swebsite. d) In the event of an order or any other legal declaration in respect of a transaction, a contract is made solely between the user andthe website’s owner or operator, and under no circumstances will the contract bebetween Monini and the user. In this regard please consult the specific conditions of sale on the linked site. Monini is liable for damages arising from the use of this site only in case of wilful or gross negligence. This does not imply any limitation on Monini’s liability regarding the liability of the manufacturer or the relative guarantees provided on the products. Such limitations of liability shall not apply even in the event of life-threatening damages, bodily injury or damage to health. Monini takes every possible precaution to maintain its site free of viruses; however, it is unable to guarantee their total absence. For this reason, we recommend the utmost care and the use of adequate protection against viruses (for example, through the installation of anti-virus software on your PC). Monini does not warrant the absence of errors and the availability of the services offered on this site. Declarations of intent and/or forecasts contained on this site have been made according to the best of our knowledge and belief. However, the results actually achieved by Monini may differ greatly from these forecasts, because they depend on a number of competitive and economic factors that are beyond the control of Monini. Without prejudice to any legal obligations in this sense, Monini assumes no responsibility to update such declarations and forecasts. The products of the Monini Group are available in many countries worldwide. This website is intended for users with permanent or temporary residence in Italy. The descriptions of the products on the site are issued solely for information purposes and they do not imply that these products and trademarks are available outside Italy. In order to create a link to this site, please send a request by e-mail to the address info [at] monini [dot] com, including: (i) details of the person in charge of hyperlink management; (ii) applicant details; (iii) the URL of the site where the link to this site will be located. Monini reserves the right to assess and make an incontestable decision about these requests with appropriate feedback. In case of a lack of response by Monini, the request should be considered rejected. Otherwise, links to this website are not allowed, and any violations of these terms will be pursued in accordance with the legislation in force at that time.